Pietersite from Namibia, a variety of Quartz with dominant gold hues. Elephant Skin Jasper, also known as Calligraphy Stone and found in the Himalayan mountains in India. Black Obsidian. This rock is not a mineral, but a form of natural glass. It is formed from volcanic lava that has cooled quickly. Chevron Amethyst. This rock is made from a combination of white Quartz and Amethyst, typically has a striped pattern of lavender, purple, or white. This is considered a highly spiritual stone giving the energy for wisdom and peace of mind. Blue Adventurine. This stone is said to enhance masculine energy in men and women and is used to help harness wisdom and strength. Black Jasper. This stone is a dense and opaque member of the Quartz family. Black Jasper is one of the more uncommon types of jasper. It is used for grounding, reflection and contemplation, in addition to energetic protection purposes. One of our Master carvers is Walmere from Brazil. He is considered one of the world’s best crystal skull carvers. In our collection we have sculptures made of Stibnite, White Quartz, Rock Quartz, Clear Quartz, Brazilian Smoky Quartz, Astrophyllite, and Black and Green Tourmaline. Eagles, Wolves, Horses, Birds, and Puppies. 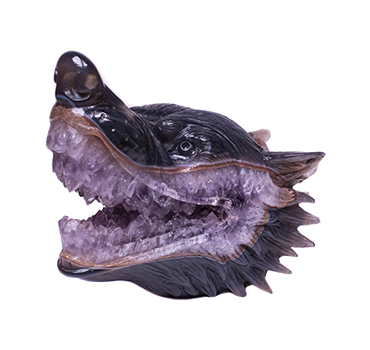 Our carvings are made from various types of Agate with Quartz and Amethyst, Lapis Lazuli, Orange Calcite, Kyanite, and Rainbow Fluorite to name a few. We have a variety of Quartz and coloured Agate fairy and mermaid carvings. 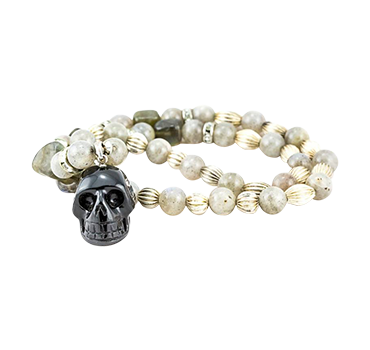 We even sell beautiful hand-crafted crystal skulls to wear as a necklace, so you can take the energy of a crystal skull wherever you go. 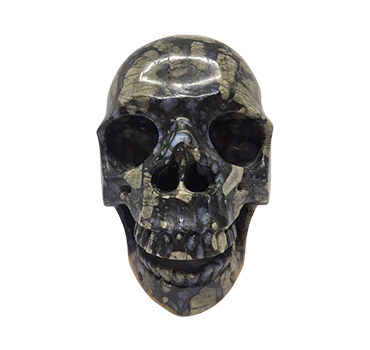 Visit our page Crystal Skulls to see our hand carved pieces.